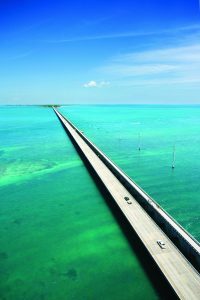 There may be no better single road trip in the United States than the Overseas Highway through the Florida Keys. As the southernmost leg of U.S. Highway 1, it remains a modern travel wonder and one of America’s classic drives. The Overseas Highway represents a remarkable engineering feat: 113 miles of roadway and 42 bridges. The Atlantic Ocean lies on one side of the highway, with Florida Bay and the Gulf of Mexico on the other—providing drivers breathtaking vistas of open sea and sky. Today, drivers can leave Miami and travel the full length of the Overseas Highway, through all the Keys to Key West, in about four hours. However, trailblazing travelers should allow time to experience the natural beauty of the ever-changing land and sea bordering and framing the roadway, as well as sunrises and sunsets that can be viewed from the road. Mile Marker (MM) by iconic Mile Marker, the highway is also the foundation of the Florida Keys Overseas Heritage Trail, which is to be completed by December 2018. The trail is a multi-use bicycle and pedestrian trail that is to extend 106 miles from Key Largo to Key West, as a recreational greenway for hiking, running, bicycling, fishing, and more. Just three weeks after Hurricane Irma, on September 10, 2017, the Florida Keys reopened to visitors. Following the storm—more than ever—the Overseas Highway became a symbol of the road to recovery—and “the road home” for residents and visitors alike. Other local officials credited the quick reopening of the Overseas Highway and the Florida Keys to the restoration of utilities, completion of significant infrastructure repairs, and the necessity of resuming the tourist-driven Keys economy. Tourism’s value to the Keys is approximately $2.7 billion. Key Largo and Key West were least affected by the storm and most facilities and attractions reopened quickly. Reopenings, however, are ongoing, with most attractions and dining venues along the Overseas Highway open throughout the Keys. The underwater life of the Florida Keys is also alive and well—and also “open for business.”Off Key Largo, divers and dive operators quickly reported that long-favorite dive and snorkel sites remained intact, despite some topographic changes and a displacement of sand. Beloved dive and snorkel sites like Molasses Reef, “Christ of the Abyss” (a nine-foot-tall, 4,000-pound statue overlooking a still-thriving coral reef), and world-renowned wrecks such as the Duane all remain open for business. In fact, Key Largo dive operators—many of them Blue Star companies promoting marine conservation—have excitedly noted that the experience on some wreck dives is like seeing them for the first time. This provides yet another reason to hit the Overseas Highway, starting with Key Largo. The jumping-off point to the Florida Keys is Key Largo, about 50 miles south-southeast of Miami and beginning at MM 107, running to 90. Keys underwater conservation was underway in 1960, with the dedication of John Pennekamp Coral Reef State Park off Key Largo (MM 102.5), named for a late Miami newspaper editor who championed local environmental preservation. As the first such underwater preserve in the United States, this refuge offers over 50 varieties of delicate corals and more than 600 different species of fish for the viewing pleasure of divers and snorkelers. Pennekamp and the adjacent Florida Keys National Marine Sanctuary cover about 178 nautical square miles of coral reefs, seagrass beds, and mangrove swamps. The land-based part of the park also features excellent hiking and camping. Islamorada (stretching from MM 89 to MM 66) is the centerpiece of a group of islands known as the “purple isles.” The islands feature a heavy concentration of the stunning violet sea snail, and “morada” is Spanish for purple. 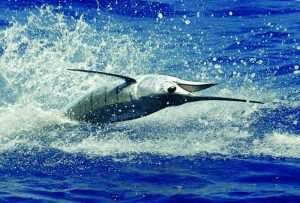 Also known as the “Sportfishing Capital of the World,” Islamorada is heralded for its angling diversity and features the Keys’ largest fleet of offshore charter boats and shallow water backcountry boats. According to the International Game Fish Association, the Florida Keys boast more sport-fishing world records than any other destination on the planet. Numerous high-profile figures, including past presidents and British royalty, have visited Islamorada to fish or compete in acclaimed fund-raising fishing tournaments. For fishing, shopping, tasty food, and a Keys-y vibe, it’s hard to beat world-renowned, Robbie’s Marina of Islamorada (MM 77.5). The Hungry Tarpon Restaurant at Robbie’s is a great place to try fresh tuna sashimi salad, local lobster, grouper, classic key lime pie, and more. Marathon, stretching from MM 65 to 45, is the heart of the Florida Keys and is home to Crane Point, a 63.5-acre attraction (MM 55) that is one of the most important historical and archaeological sites in the Keys. The area contains evidence of pre-Columbian and prehistoric Bahamian artifacts and was once the site of an entire Indian Village. While it is discouraged to feed marine life in the Florida Keys Marine Sanctuary, visitors can swim with and feed the fish at busy Florida Keys Aquarium Encounters (MM 53.1). There’s also The Turtle Hospital (MM 48.5), a veterinary center dedicated to the “rescue, rehab, and release” of sea turtles—and open for public tours. Those hungering for Keys seafood and atmosphere will want to head to Keys Fisheries (MM 50). This famed restaurant and market are known for its giant lobster Reuben sandwich, but there’s much more on the menu, including stone crab when in-season (October 15 to May 15) and lots of fresh local seafood to cook back at the campground. Southwest of Marathon, the Lower Keys stretch from MM 45 to MM 4. The sheer sweep of the Straits of Florida and the Gulf of Mexico is readily seen from Bahia Honda Bridge (MM 38). Bahia Honda State Park, like Pennekamp and Long Key state parks, also features day use activities that include hiking, snorkeling, and a scenic Calusa Beach, adjacent to Bahia Honda Bridge, for sunbathing. Big Pine Key (MM 30) is noted for Looe Key Reef, an area of the Florida Keys National Marine Sanctuary located about six miles offshore, and serves as home to the 9,200-acre National Key Deer Refuge, protecting the endangered miniature Key deer, living only in the Keys. Few U.S. cities can rival Florida’s Key West for its character–make that characters. This colorful, quirky island has been home to a passel of colorful, quirky characters who call themselves conchs after the mollusks that thrive in the waters here. 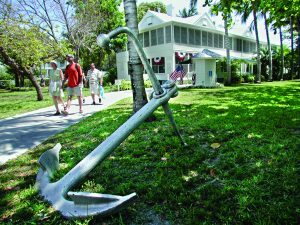 Ernest Hemingway, for example, left such a mark on Key West that exploring his old stomping grounds is reason enough to visit the island. “Papa” moved to Key West in 1931 with his second wife, Pauline. The couple was gifted the house at 907 Whitehead Street. Hemingway is one of the world’s most famous authors and a Key West icon. The Ernest Hemingway House & Museum, now a registered national historic landmark, was built in the Spanish Colonial style of native rock hewn from the area. Today, the Key West house and its furnishings remain intact, as if Hemingway were about to return from an afternoon of fishing or drinking. A visit to the Hemingway house is obligatory for tourists. But, those who want to meet live Key West characters head for Mallory Square. If there is a single Key West attraction that sums up the entire island experience, it’s the nightly “Sunset Celebration.” Every evening, as the glowing orange sun sinks beneath the horizon, Key West’s colorful characters turn out to celebrate the colorful event. Legend has it that playwright Tennessee Williams started the tradition when he lived in Key West. 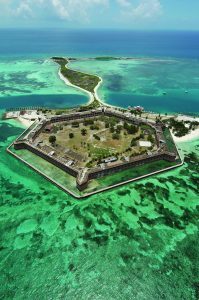 Further afield, 70 miles west of Key West, Fort Jefferson National Monument in the 100-square-mile Dry Tortugas National Park offers one of America’s most unique outdoors outings. This former 19th-century fort can only be reached only by boat or seaplane, and is part of a protected national park. A Key West sunset is much more than a natural phenomenon. It has its own nonprofit organization, the Key West Cultural Preservation Society. On any given evening, visitors meet up with arts and crafts exhibitors, street performers, food sellers, and even psychics. It’s a multicultural mélange that has to be experienced to be believed. After all that exploring near and far, Blue Heaven is a classic Key West bar and restaurant for meeting local characters. Key West’s close connection with Cuba and its characters (including Hemingway) can also be explored (and tasted) at El Meson de Pepe at Mallory Square. The Harry S Truman Little White House Museum. Key West as the capital of the United States? Ah, what a wonderful country that would be! 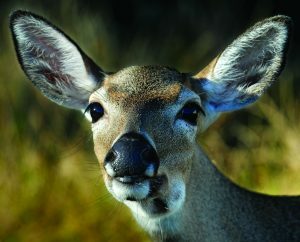 For more information on the Florida Keys, please visit fla-keys.com. To book your next adventure, visit our website, thousandtrails.com.